TORRANCE, Calif. (November 3, 2009) – The Board of Directors of the Sports Car Club of America has ratified a Honda Performance Development, Inc. proposal to begin supplying Honda Formula F engines for competition in the SCCA’s Formula F (FF) class in 2010. Through its introduction to the category, HPD hopes to strengthen FF’s position as the first step in American open-wheel racing. The Honda Formula F engine is based on the Fit L15A7, a 1.5-liter engine that can be installed into several existing FF chassis. Testing has shown that the Honda engine provides performance equal to the long-out-of-production “Kent” engine, while featuring a modern fuel-injected design with superior service life, improved availability and lower operating costs. A prototype, utilizing a Swift DB-1 chassis and HPD-developed bolt-on conversion kit, made its public debut during the FF 40th Anniversary Celebration at Road America in late July. The Swift-Honda, along with a Honda FF engine mated to a Citation chassis, was also on display during last month’s SCCA National Championship Runoffs at Road America. The Honda FF engine has been developed by Honda Performance Development in cooperation with Sandy Shamlian of Quicksilver RacEngines. The engine was developed to equal the performance of the Kent powerplant through utilization of an HPD-developed intake restrictor plate and appropriately mapped Engine Control Unit (ECU). If additional performance adjustments are required, changes can be made to the restrictor plate and/or the ECU maps to achieve this goal. Original equipment in the 2009 Honda Fit, the L15A7 is a fuel-injected, 1.5-liter, overhead cam engine, at the beginning of its current production generation. Per Honda corporate policy, a minimum of 10 years’ parts support is mandated at the conclusion of production. HPD will supply all parts from intake through exhaust, including multiple chassis conversion kits. The result will be a modern and reliable engine requiring minimal maintenance and tuning. Specifically, HPD expects to offer FF competitors the opportunity to reduce their engine operating costs. Engine rebuilds will be reduced, while competitors should also experience a reduction in the need for top-end refreshing. In addition, crankshaft and valve-spring life should be extended dramatically; and most ignition and all carburetor maintenance will be eliminated. The first conversion kit offered will be for the venerable Swift DB-1. This complete, race-ready package will sell for $11,750. It will include a base L15A7 engine, FF engine conversion kit (including intake, exhaust, dry sump, restrictor plate and ECU), and a bolt-in DB-1 chassis conversion kit, to permit installation of the engine without welding or other major modifications. Individual component parts will also be available for purchase separately. HPD is working on two additional conversion kits for the Swift DB-6 and Van Diemen (1999-current) chassis. Market release of these kits is also expected prior to the 2010 club racing season. Honda Performance Development (HPD) is Honda’s racing company within North America. Founded in 1993, and located in Santa Clarita, Calif., HPD is the technical operations center for Honda and Acura’s high-performance racing cars and engines. In addition to its new grassroots motorsports business, HPD is the single engine supplier to the IndyCar Series and spearheaded Acura’s championship-winning efforts in the 2009 American Le Mans Series. SANTA CLARITA, Calif. (October 26, 2009) – On Saturday, October 24, customers visiting the Best Buy in Santa Clarita were greeted with something out of the ordinary. There on the sidewalk was the deFerran Motorsports Acura American Le Mans Series P2 sports car. Honda Performance Development, Inc. (HPD) arranged the event to correspond with the launch of the XBOX 360 Forza Motorsport 3 game, in which the Acura ALMS cars are featured. Those who purchase the game from Best Buy through November 10 will be invited to attend HPD’s Open House on Saturday, November 14, from 1 to 4 pm. Potential attendees may bring a guest and are required to bring the Open House invitation available at the Best Buy in Santa Clarita, with their receipt for the game, to HPD in order to attend the event. HPD’s Open House will include a tour of the facility with catered lunch, and IndyCar drivers will be on hand for autographs. The Forza Motorsport 3 game will also be on display and available to play. This marks only the fourth time in the history of HPD that such an event will be held. Joining the Acura ALMS car on display at Best Buy was a 2010 Acura TL provided by Valencia Acura. HPD partnered with Valencia Acura in making the event possible and, following Saturday’s event at Best Buy, the Acura ALMS car was moved to the Valencia Acura showroom, where it will be displayed for approximately two weeks leading up to HPD’s Open House. Several Valencia Acura customers have also been invited to take part in Open House activities. HPD hopes that this is the first of many community activities that it can be part of – in conjunction with other local businesses – to provide the residents of the Santa Clarita Valley with a unique and interesting perspective on HPD’s racing operations. If you are interested in learning more about Honda Performance Development and some of its new racing activities, please log onto to http://racing.honda.com/hpd or contact 661-294-7300. Honda Performance Development (HPD) is Honda’s racing company within North America. Founded in 1993, and located in Santa Clarita, Calif., HPD is the technical operations center for Honda and Acura’s high-performance racing cars and engines. HPD is the single engine supplier to the IndyCar Series and spearheaded Acura’s championship-winning efforts in the 2009 American Le Mans Series. 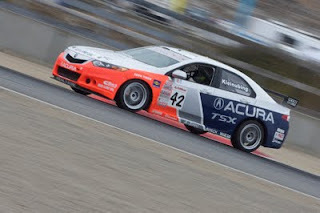 The stage was set for many Acura celebrations during the final round of the 2009 American Le Mans Series at Laguna Seca Raceway. And the exciting weekend didn’t disappoint. For the third year in a row, the Petit Le Mans had proven to be very frustrating for the Acura contingent, as another rash of misfortunes started with the brutal Scott Sharp crash and complete car construction by the Patrón Highcroft team, followed by tough breaks for the de Ferran Motorsports and Lowe’s Fernandez teams in the race. But the page had turned as the three Acura racing operations headed to the picturesque Monterey Peninsula in preparation of the ALMS season finale. Somehow, traveling to the coastal California area south of San Francisco seemed to revitalize the teams, the drivers and everyone surrounding the ALMS tour. Maybe it’s the fact that the final race was imminent, or just the great atmosphere. Whatever it was, the scene brightened considerably for the Acura bunch. The event would be Gil de Ferran’s final drive in a race car. After two years of sports-car racing, Gil felt it was time to concentrate on his management of de Ferran Motorsports. So, at Mid-Ohio, he announced that Laguna Seca would be his final race. And his team put together a great finale, with Gil’s former IndyCar team owner, the legendary Jim Hall, coming to the Monterey and bringing three famous cars from his stable; the 1995 Pennzoil Reynard Gil drove to his first IndyCar win at Laguna Seca in 1995; the famed Chaparral 2 sports car that won at Laguna Seca in 1964; and the legendary Chaparral 2F with the very first high rear wing that had raced in the Can-Am in the mid-1960s. In addition, as a tribute to Hall, de Ferran ran new white livery on his Acura ARX-02a prototype with the ‘Circle 66’ car number. Sponsors such as XM Satellite Radio and Panasonic were portrayed in silver livery on the car. It made for a great look. On Thursday, a test day at the track, the de Ferran team unveiled its new paint scheme, as well as the Jim Hall-inspired car display in the paddock area. It was neat to see the current sports car alongside the cars of some 45 years ago. Hall was pleased to be at the track with Gil and his family. Plus, the crowd of onlookers was impressive, as crew members from the entire paddock stopped by to get a “close-up” view of the old cars and visit with Hall and de Ferran. Later that day, Acura hosted a photo shoot involving Acura’s three cars, six drivers, and all team members, as well as the HPD engineering staff. In addition, the 13 trophies that were won by Acura cars, drivers and teams in 2009 were displayed as part of the photo op. The photos made a great commemoration for the record 2009 season, which included the carmaker becoming the first auto manufacturer to win LMP1 and LMP2 classes in the same American Le Mans Series campaign. Patrón Highcroft Racing, coming back from the incredible car rebuilding job at Petit Le Mans, came to the Laguna Seca race with a 21-point lead over the de Ferran squad. But the team had a new problem, as many of its members were suffering from the flu. Perhaps that 20-hour construction of the No. 9 Patrón Highcroft Acura ARX-02a at Petit Le Mans – along with weather conditions changing from hot and humid to cold and rainy – may have attributed to the illness on the team. In fact, Team Manager Rob Hill wasn’t able to appear at the track until Friday. Still, the Patrón Highcroft team was prepared for the championship fight in the concluding round of the 10-race series. Drivers David Brabham and Scott Sharp were ready to go when testing began on Thursday afternoon. The Patrón Highcroft group knew its goal of completing 70 per cent of the race was well within reach, but the team wanted to race for the win against the de Ferran and Fernandez efforts. The Lowe’s operation, meanwhile, had clinched the team, driver and manufacturer titles in LMP2, so they weren’t required to hold back in hopes of simply finishing. This time, the team was set to compete for the overall win. A tight circuit like Laguna Seca could be well-suited to another possible LMP2 overall win. An LMP2 car had not won an ALMS race overall since 2008 at Detroit, when Franck Montagny and James Rossiter captured the crown for Andretti Green Racing. The teams were watching the weather closely again this week, noting that fog and low clouds from the Monterey Bay can roll into the racing facility and pose a major change from sunny afternoon conditions. The track surface can also cool quite quickly, while the dense air frequently necessitates engine adjustments. In Thursday’s late afternoon testing runs, there was no doubt that de Ferran wanted to establish his love for the 2.238-mile, 11-turn road course. Immediately, Gil was quick with a one-minute, 12.557-second lap, followed by Diaz at 1:12.983. 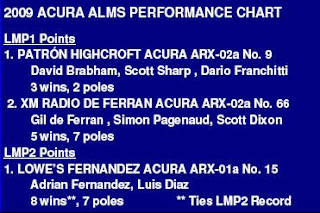 The three Acura cars had more than a one-second advantage over the rest of the field. Last year, in qualifying, the four Acura LMP2 entries were in the top five positions at Laguna Seca, so, the Acuras were expected to be at the top of the speed chart. Brabham was able to notch second in the test session with a 1:12.873 reading before Sharp jumped in for the final segment of testing. Both Simon Pagenaud and Adrian Fernandez also got laps in their respective cars as the sun set over the bay. On Thursday night, the Patrón Highcroft team had decided not to run the Friday morning practice, since the team was pleased with the car in Thursday’s testing. Perhaps a bigger reason was the flu factor within the squad, and the thought that giving the team some added rest would be beneficial throughout the weekend. Pagenaud was quickest early in the Friday morning practice, but the de Ferran team had to send its car to the garage area with a suspension problem. A left-front bearing had failed, and the team needed time to make the necessary repairs That left the Lowe’s Acura as the only Acura on track for the remainder of the morning session. Fernandez put the car P1 at a 1:13.311 before parking in the pit area. Guy Smith later bettered Adrian’s clocking with a 1:13.096 in the No. 16 Dyson Racing Mazda. With numerous support series competing during the weekend, the different types of tire rubber caused some slippery track conditions. It figured to be difficult to see any track records established during qualifications later in the day. But the Acuras showed some great, competitive action between the three teams. Pagenaud and Fernandez battled for the top spot during the Friday afternoon practice. Brabham led off in the Patrón Highcroft Acura after sitting out the opening runs in the morning. At the 30-minute mark of the afternoon session, it was Pagenaud at a 1:13.491, with Fernandez at 1:13.606 and Brabs at 1:14.355. Then, de Ferran, Diaz and Sharp made the switch to their respective machines. Diaz, who had qualified on the front row a year earlier at Laguna, quickly showed his prowess and held the overall top spot at 1:12.355. In the last minute of practice, de Ferran moved to the top of the charts with a 1:11.943. Brabham wasn’t as happy with his mount, but the personable Aussie knew there were a few tricks to try on the No. 9 car that might assist him as he looked to repeat his 2008 pole at Laguna. The LMP1 track record of 1:11.175 was up for grabs in Friday’s late-afternoon qualifying session, but the lap times established in practice never got close enough to place the record in jeopardy. The track conditions were cool, which could help the teams in the quest for the pole position and a potential track record. But, once again, the fog rolled into the track and hindered traction. Diaz was quick right out of the pit lane, as he took the No. 15 Lowe’s Fernandez Acura LMP2 car to a 1:13.928 only four minutes into the 20-minute qualifying run. By his fifth lap, Diaz was P1 with a 1:11.310. De Ferran figured to be the favorite for the pole in the No. 66 machine, and Brabham could again be the sleeper for the top spot. On his seventh qualifying lap, de Ferran clicked off a 1:11.206 for the fastest time of the day. Diaz made another attempt at de Ferran’s time with several 1:13s, but he couldn’t dip into the 1:12 bracket. Meanwhile, Brabham was getting quicker with each lap. David recorded a 1:11.462 for third on the grid. Then he ripped off a 1:11.298 with four minutes remaining in qualifying. Could David upset Gil in his final race? De Ferran was on a flyer when the left front tire cut and deflated. So, it was up to Brabham to take a run at the pole on his final lap. A bit too much sliding for Brabs in the end, though, and he settled for second. It was an exciting dash for the pole, with the three Acura cars a mere tenth of a second apart. The pole was Gil’s third this year, as many as his teammate Pagenaud, and the seventh for the de Ferran team in 10 races. Now, de Ferran was setting his sights on victory in the race, his finale as a driver. The Saturday morning warm-up brought trouble for the Patrón Highcroft team. Brabs went out for just a lap, and an oil leak was discovered. The crew wheeled the car back to the garage and went through it completely. Meanwhile, De Ferran was quickest in the warm-up with a 1:14.111. So, the stars were pretty much in line for Gil to conclude his driving career with a pole and win. It would be just like he did back in 2003, in the IndyCar Series season finale at Texas. The Laguna Seca staff had named de Ferran as Grand Marshal for the weekend, so Gil had some pre-race responsibilities, in addition to prepping for the four-hour race. The Patrón Highcroft team, still battling the flu bug, finally received some time to rest after finding the oil leak in the morning. Brabham would start and drive for the first two-thirds of the four-hour event. Diaz, after his brilliant qualifying run, was the starter in the No. 15 car, and hoped for a solid stint before handing the car to Fernandez. At the drop of the green flag, Pagenaud was fast and pulled out an advantage. Brabham paced himself, but, as usual, the powerful Lola of Jon Field applied pressure. A full-course caution period came early when Paul Drayson and Klaus Graf came together in Turn Nine. On the restart, Field drove around Brabs on the front straight for second. Pagenaud was on a mission in the white No. 66 Acura, as the popular Frenchman drove away from the field. By Lap 20, Simon enjoyed a 22-second lead and he diced his way through traffic well. By Lap 27, the advantage was up to 50 seconds, as Field had held up Brabs tremendously in the corners. Finally, David was able to scoot into second, but Pagenaud was long gone at that point. On Lap 34, the yellow came out again, and Pagenaud pitted. A lap earlier, Simon had held a 69-second margin on Brabham. Brabs pitted on Lap 35 for fuel and tires. But David’s day almost ended in disaster three laps later. On the restart, Brabs’ mount was stuck in heavy traffic as he headed into Turn Two. As David maneuvered his car down the hill, a very aggressive Oliver Gavin, in one of the GT2 Corvettes, clipped Brabham’s left rear and slid by into four other machines. Playing it cool as he entered Turn Two, Brabs hit his brakes early in the No. 9 Acura and avoided the big crash. A few inches further and Brabham’s title hopes might have been buried in a ton of crash damage. Luckily for the Patrón Highcroft crew, the crash kept the yellow flag out for several laps, and David was able to return to the pits for new rear bodywork, tires and fuel. However, when the green flag flew on Lap 44, Brabs re-entered in sixth position. Pagenaud and Diaz put on a good dice for the lead for several laps before Simon was able to open up a three-second lead by Lap 51. Trouble struck Brabham again on Lap 54, when the shifter indicator on the steering wheel went out. The team decided to bring Brabs into the pits again. Would this small electrical problem cost the Patrón Highcroft team the LMP1 championship? The Patrón Highcroft crew made the call to assist David with the shifting calls as he left the pits. Brabs would have to remember his gear shifting as he drove the track, and hope that nothing else would go wrong with the electrical parts of the car. Brabham remained in sixth by Lap 60, as Pagenaud held an 18-second lead. Pagenaud extended his margin to 35 seconds by Lap 70, and Gil was getting prepared in the pit area for his final drive. The next lap brought a caution period, and Simon pitted the No. 66. Gil jumped in as the crew made a fast fuel and tire stop. Diaz also pitted and was replaced by Fernandez. The No. 48 Corsa Hybrid LMP1 prototype, with Stefan Johansson in the cockpit, was putting on a sensational drive, running second overall when it encountered a steering problem. On the restart, de Ferran got stuck in traffic and Fernandez closed the gap. Meanwhile, Brabham was two laps behind the lead pack, but the Aussie was running a consistent pace in fifth. By Lap 90, Fernandez was pressuring de Ferran with the Lowe’s machine. The nimble LMP2 Acura was very competitive in traffic and staying right with Gil. On Lap 100, de Ferran’s car came alive as the Michelins heated up. He was able to open the lead to 12 seconds. Four laps later, Brabs pitted at the two-hour, 35-minute mark and Sharp took the wheel. The Patrón Highcroft team needed about 10 laps to secure the title. Running third overall, Sharp was nursing the Acura through busy traffic. On Lap 121, both de Ferran and Fernandez pitted for the final time. Under the green flag, the de Ferran team felt it only needed to fuel the car. This would give Gil a good advantage over Fernandez, who took on tires and fuel during his stop. De Ferran hold a 20-second lead at Lap 126, but the question was, “Would he be able to hold off Fernandez?” Adrian’s fresh set of Michelins was going to be an advantage, especially as the track surface cooled in the darkness. Traffic was another problem for Gil. The heavier LMP1 Acura couldn’t get through the GT cars as easily as Adrian’s car could. Lastly, Fernandez’ smaller Acura would get better fuel mileage than the larger engine in de Ferran’s LMP1 Acura. By Lap 135, Fernandez had cut de Ferran’s lead to eight seconds. And just 10 laps later, Fernandez was a half second from Gil’s white No. 66. The race was on. It was a tremendous nose-to-tail battle, with Fernandez able to run right with de Ferran as the Acura-powered pair diced its way through lapped cars. On Lap 149, Fernandez dove under de Ferran in Turn 11 for the lead. But Gil’s LMP1 power was put to use on the long front straightaway and de Ferran soon went back to the front. Fernandez was in a strong position with better fuel mileage and fresher tires. But de Ferran’s power on the long straightaway always opened up a gap. Still, it was never more than a second. The racing was sensational, with two guys in their 40s putting on a great show. You would have thought it was 10 years earlier in the CART days. Lap after lap, Fernandez applied pressure, and de Ferran held him off each time. With two laps remaining, Adrian was only .471 seconds behind Gil at the start/finish line, and he was much closer on other parts of the circuit. On the final lap, de Ferran’s crew told him to use his fuel to hold off Fernandez. Adrian was pressing as hard as he possibly could. At the checkers, de Ferran completed a storybook ending by capturing his final race by .662 seconds. Adrian finished second, and drew some consolation from his eighth race win of the 2009 season, tying the LMP2 mark set by Penske Racing in 2007. And Sharp, some three laps down due to the Patrón Highcroft team’s assorted problems, came home third overall, securing the coveted LMP1 team and driver championships. There were smiles all around the Acura camp. The 1-2-3 overall finish was Acura’s fifth podium sweep of the year, and no car maker in ALMS history had ever taken both prototype championships in the same season. 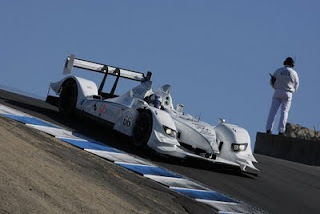 TORRANCE, Calif. — Acura Motorsports teams and drivers dominated the 2009 American Le Mans Series with record runs in both the LMP1 and LMP2 prototype classes. 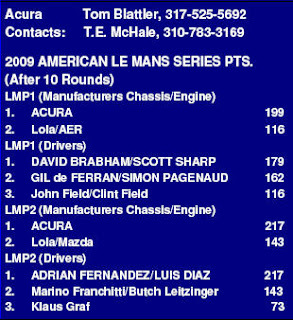 The 2009 10-race ALMS campaign concluded last weekend with another Acura 1-2-3 overall finish at Laguna Seca Raceway. It marked the fifth time in 2009 that Acura placed in the top three positions overall. Acura became the first carmaker in ALMS history to win both the LMP1 and LMP2 classes in the same season. With eight overall victories and nine pole positions, the new, technically- advanced Acura ARX-02a sports car was impressive in its debut this year with Patrón Highcroft Racing and de Ferran Motorsports leading the way. After a hard-fought LMP1 points battle, David Brabham and Scott Sharp took the No. 9 Patrón Highcroft Racing Acura ARX-02a to the prestigious driver and team championships with a consistent performance through the North American tour. 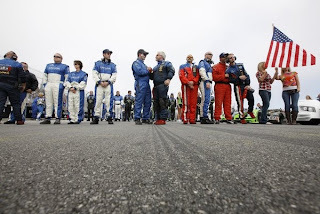 Led by three wins [St. Petersburg, Road America and Mosport], the Connecticut-based squad notched podium finishes eight times and came back from a devastating crash at Petit Le Mans to finish sixth for valuable points. It was Patrón Highcroft Racing’s first LMP1 crown. The de Ferran team’s driving duo of Gil de Ferran and Simon Pagenaud paced many of the races with an LMP1-leading five wins and seven poles in the No. 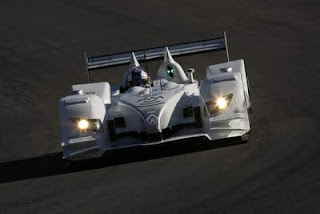 66 XM Satellite Radio Acura ARX-02a, but the pair was just short in the final LMP1 point tally. Veteran de Ferran won at Laguna Seca in his final race as a driver. He will continue as a team owner. Pagenaud clocked three poles and five fast laps in 2009. It was a record-setting year for the LMP2 Lowe’s Fernandez Acura team with Mexican driving stars Adrian Fernandez and Luis Diaz scoring eight LMP2 class wins. That mark tied the 2007 LMP2 win record of Penske Racing with drivers Timo Bernhard and Romain Dumas. In addition to the eight wins, Fernandez and Diaz posted seven poles and five fast race laps. The Lowe’s team also won the Michelin Green X Challenge title for the best fuel economy. MONTEREY, Calif. (Oct. 11, 2009) - Pierre Kleinubing, of Coconut Creek, Fla., led Sunday’s Applied Computer Solutions Monterey Sports Car Championships Presented by Bondurant from start-to-finish and captured his fifth SCCA Pro Racing SPEED World Challenge Touring Car Presented by Toyo Tires Championship. Teammate Peter Cunningham, of Milwaukee, Wis., and James Clay, of Blacksburg, Va., completed the podium at Mazda Raceway Laguna Seca. Kleinubing started his No. 42 Acura/RealTime/Red Line Acura TSX on the pole, and knew he had to win if he was to have a chance to secure the Drivers’ Championship and the Manufacturers’ Championship Presented by RACER Magazine for Acura. He did just that, taking the lead on the standing start and leading every lap to secure his second win of 2009, the 29th of his career. Kleinubing beat Cunningham to the stripe by 0.610-second, averaging 72.615 mph. Kleinubing came into the race 54 points behind Jason Saini and Acura was one point behind Mazda. With the pole and Saini’s eighth-place qualifying effort, Kleinubing picked up 15 points on the leader. Saini needed to get into the top five in order to win the title, but finished eighth in his No. 74 MAZDASPEED/Stoptech/ProParts MAZDA6. “I didn’t know the Championship scenarios, but everyone else on the team did,” Kleinubing said. “I just wanted to do my part. When we took the checkered flag, I waited a little bit until Turn Four, then I asked ‘did we win the Championship?’ You never know. Maybe everyone pulled over and let [Saini] by! I wasn’t thinking about anything other than winning the race. “Coming into the weekend, I knew my chances were pretty slim. I was surprised at Jason [Saini’s] pace this weekend. They missed something and we had a great handling car. 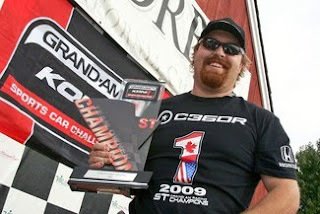 As the team owner of RealTime Racing, Cunningham’s primary goal was to secure the Manufacturers’ Championship for Acura, entering the weekend one point behind Mazda. Kleinubing’s pole tied the Championship, meaning whichever brand finished ahead would take the title. “We knew what had to happen,” Cunningham said. “We honestly didn’t think, coming into the weekend, that [RealTime] had a shot at the Drivers’ Championship, but we knew that we had a shot at the Manufacturers’ Championship and that was our primary objective today. We knew that we had to stay clean at the start and stay focused to the end. Clay started second in the No. 36 BimmerWorld/GearWrench BMW 328i, but struggled off the line, falling to fourth. From there, he waged a fierce battle with the No. 75 MAZDASPEED/Stoptech/ProParts MAZDA6 of Chip Herr. On lap eight, the two made contact, going into the Andretti Hairpin, allowing Nick Esayian to move past both into third place in the No. 34 BimmerWorld/GearWrench BMW 328i. A four-lap caution from laps eight through 12 bunched the group back up, and on lap 15, Clay was around Herr, taking third from his teammate Esayian two laps later. Clay was able to catch the leading Acura duo, setting the Débaufré Fastest Race Lap of 1:38.112 (82.118 mph) in the process. While he was able to catch Cunningham, he was not able to make a pass. Esayian finished fourth to earn his fourth top-five finish of the season. Making a cameo appearance, and his first start since the season-opener at Sebring, Herr was Mazda’s top car throughout the race, and finished fifth. Charles Espenlaub (MAZDA6), Seth Thomas (BMW 328i) and Saini (MAZDA6) finished sixth through eighth. Making his first-career World Challenge start, Graham Downey, of Morgan Hill, Calif., finished ninth in the No. 7 Redstone/Blacktrax Honda Civic Si, advancing four positions and earning the Sunoco Hard Charger award. Patrick Lindsey, of Santa Barbara, Calif., completed the top 10 and took the AutoWeek Move of the Race for his pass of Espenlaub and Thomas for sixth on lap 21 in his No. 57 StreetUnit.com/Snapitt.com MAZDA6. Kleinubing tied Cunningham and Michael Galati in securing his fifth World Challenge Championship, although all of Kleinubing’s have come in the Touring Car class while Cunningham and Galati have won in multiple categories. Kleinubing finished with 973 points to Saini’s 960. Defending Champion Cunningham finished third, with 921, followed by Thomas (878) and Espenlaub (847). Acura earned its eighth Manufacturers’ Championship, the 13th for American Honda in total. It finished with 72 points to Mazda’s 65. BMW finished third, with 42. Sunday’s race will be broadcast Tuesday, Nov. 3 at 2 p.m. Eastern, 11 a.m. Pacific on SPEED. MONTEREY, Calif. — Gil de Ferran’s storybook retirement win, Patrón Highcroft Racing’s LMP1 championship and Lowe’s Fernandez Racing’s record-tying eighth 2009 win were just some of the stories Saturday at Laguna Seca Raceway in the wild American Le Mans Series finale. De Ferran, co-driving with young star Simon Pagenaud, hung up his racing helmet in dramatic fashion with a sensational overall win in the four-hour Monterey Sports Car Championships on the famed 2.238-mile road circuit. But it wasn’t easy for de Ferran. The driver of the No. 66 XM Radio Acura ARX-02a prototype sports car was pressured by the No. 15 Lowe’s Fernandez Acura ARX-01b LMP2 machine of Adrian Fernandez for the last hour in wheel-to-wheel action. De Ferran and Fernandez swapped the lead several times before the Brazilian star held off the Mexican racer by just .662 seconds at the finish. The win was the fifth of the year for de Ferran Motorsports and gave Gil a spectacular sendoff of a stellar racing career. The de Ferran team also had a season-high seven pole positions. The Acura 1-2-3 overall sweep was the fifth of the season for the auto manufacturer in the ten-race ALMS campaign that saw Acura become the first car marque to win LMP1 and LMP2 driver, team and manufacturer championships in the same year. The Lowe’s Fernandez team, with drivers Fernandez and Luis Diaz, finished second overall but took its eighth LMP2 class victory in 2009, tying the ALMS LMP2 win record set by Penske Racing in 2007 with Timo Bernhard and Romain Dumas. Third overall at Laguna Seca was the Patrón Highcroft Racing pair of David Brabham and Scott Sharp in the No. 9 Patrón Highcroft Acura ARX-02a. The finish gave Brabham and Sharp the LMP1 driver crown and Patrón Highcroft Racing the LMP1 team title. Brabham and Scott recorded three overall wins this year in team owner Duncan Dayton’s first ALMS point championship year. The Patrón Highcroft team suffered through a tough two-week span by building a new Acura from scratch at Petit Le Mans after a horrific crash involving Sharp. Then a flu bug hit the team’s crew that saw several of the team members on the sidelines entering the Laguna Seca race. The Lowe’s Fernandez team also collected the Michelin Green X Challenge prototype win as well as the Green X series championship. GIL de FERRAN (#66 XM Radio de Ferran Acura ARX-02a): "It certainly wasn’t an easy win today. I was driving hard to hold off Adrian [Fernandez] and trying to save fuel. Coming into the weekend, there were several thoughts going through my head. But once I was in the car, I thought only about winning the race. I had a job to do here. I didn’t really think about my last race until I shut off the engine. Then I had a lot of thoughts about my career. Simon drove fantastic today and gave us a big lead. But Adrian wasn’t about to give us an easy win. He was tough. I am just glad it is over now. It was a dream weekend for me." SIMON PAGENAUD (#66 XM Radio de Ferran Acura ARX-02a): "The XM Acura felt so good today. I could drive it fast. I was able to open up a good margin, about a minute. I was nervous at the end, because I knew Gil would be tight on fuel to finish. But the crew did a great job of controlling the fuel management and we won our fifth race this year." ADRIAN FERNANDEZ (#15 Lowe’s Fernandez Acura ARX-01b): "What a great way to finish a super season. I knew our car would be fast in the race, and we might have a chance for the overall win. I could see Gil was saving fuel, and I was pressuring him. I just came up a bit short. But overall, it feels great to tie the LMP2 win record and score the driver and team championships. It was super." LUIS DIAZ (#15 Lowe’s Fernandez Acura ARX-01b): "We have had one of the best seasons in ALMS history with eight wins and two championships. It has been a thrill to drive with my racing hero, Adrian. He gave me an opportunity to race with a great team and a super manufacturer in Acura. I couldn’t ask for a better situation. Today was a spectacular way to finish our season." DAVID BRABHAM (#9 Patrón Highcroft Racing Acura ARX-02a): "We had a few problems today. But our team’s plan was to get to the finish line. If we could do that, we would win the championship. The past two weeks have been very hard on our team with the crash and flu. But they are professional and put together a super effort to bring Patrón, Acura, Michelin and the entire operation a championship season." SCOTT SHARP (#9 Patrón Highcroft Racing Acura ARX-02a): "I can’t believe it is over. It was tough season racing in the LMP1 class. The de Ferran team is one of the best and, to beat them, really feels good. This team put in long hours and never made a mistake to get us back in action each week. The effort at Petit to built a new car was phenomenal. Then, here at Laguna Seca, the flu bug hit everyone hard. But the team worked together and gave us a title tonight." 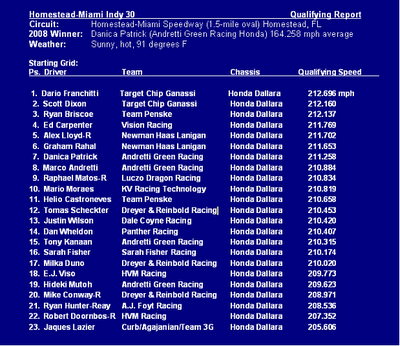 The three IndyCar Series championship contenders -- Dario Franchitti, Scott Dixon and Ryan Briscoe -- qualified 1-2-3 Friday at Homestead-Miami Speedway in preparation for Saturday’s season-ending Homestead-Miami Indy 300. Franchitti’s pole was worth one championship point, bringing him within four points of his Target Chip Ganassi Racing teammate and series leader Scott Dixon. Third-starting Briscoe is third in the points, eight behind Dixon. There are a variety of scenarios for each driver to claim the title. Either Dixon or Franchitti can claim the crown by winning the race, while Briscoe can also win the championship with a race victory -- as long as Dixon does not finish second and earn the two bonus points available for leading the most laps. With a series-leading five race victories this season, Dixon would claim the title on a tie-breaker with either Franchitti or Briscoe. This weekend’s 200-lap race, the 17th and final round of the 2009 IndyCar season, starts Saturday at 5 p.m. EDT, with live television coverage on Versus. The 2009 Petit Le Mans can be wrapped up in three words, WHAT A MESS! And that isn’t just the Acura Motorsports viewpoint on the scheduled 1,000-mile sports-car endurance classic at the high-speed Road Atlanta circuit. It pretty much covers the entire week surrounding the Petit event. I actually felt sorry for the management of Road Atlanta coming into the week leading up to the 10-hour contest. Heavy rains had turned greater Atlanta into a disaster area, and the west side of the Atlanta region was completely under water. Several highways were closed, many communities were devastated and the media was making hourly reports to warn the residents of incoming rain. In these conditions, a racing event some 50 miles northeast of Atlanta was of little importance to the locals. That made it tough on ticket sales for Petit Le Mans. The addition of drivers like Indy 500 winners Scott Dixon and Dario Franchitti to the Acura lineup definitely helped the track’s sales, as did the return of the factory Audi and Peugeot teams. But the weather was a hard obstacle for the crowd to leap. Action would begin with a testing session the week prior to the race. At least, that was the plan. Unfortunately, some of the hardest rain in years hit the northern portion of Georgia, turning the red clay into a river of red mud. The track became a quagmire, and the Road Atlanta maintenance crew had its hands full. Some minimal testing took place on Sunday – six days before the event – but it was clear that the clean-up surrounding the 2.458-mile track was going to be a chore. Monday and Tuesday of race week launched a reclamation project for track officials. The task of cleaning the paddock, the spectator hillsides and the dirt roads throughout the grounds was immense. Luckily, the weather cleared, and the paddock area came to life; with crews, officials and sponsors constructing tents, trailers and work areas in anticipation of the weekend. There was plenty of buzz in advance of this year’s Petit Le Mans with the new LMP1 Acura ARX-02a cars from Patrón Highcroft Racing and de Ferran Motorsports competing against the new Audi prototypes, winners at the 12 Hours of Sebring; and the lightning-fast Peugeot, winner of the legendary 24 Hours of Le Mans. Some of the world’s greatest drivers were set to do battle in a fierce fight for the coveted Petit Le Mans title. Audi and Peugeot were not able to get the testing laps they would have liked due to the early rain, and the same was true of the Acura-powered de Ferran team. So, this stellar lineup of drivers was anxious for a day of testing on Wednesday when Road Atlanta re-opened for action. There were questions about the Acura and its competition level against the Peugeot and diesel-fueled Audis entering the Petit weekend. In the inaugural ARX-02a run at Sebring, the new Acura was quick enough for the pole thanks to Dixon’s impressive lap. But the gas-powered, four-liter Acura V-8 just didn’t have the “ponies” to match up with the diesels in the race. Now, six months later, would the Acura have the power to race consistently with both Audi and Peugeot? On the LMP2 side, the Lowe’s Fernandez team had been a dominant force throughout the season, with seven wins and six poles. But the Dyson Racing Mazda Lolas were showing great straightaway speed with their turbocharged engines. The Lowe’s team, with drivers Adrian Fernandez and Luis Diaz, had to resort to some clever race strategy to take wins at Mid-Ohio, Road America and Mosport. The John Ward-engineered Acura was handling well, but the Lowe’s machine seemed to be down on horsepower versus the turbo Mazdas. 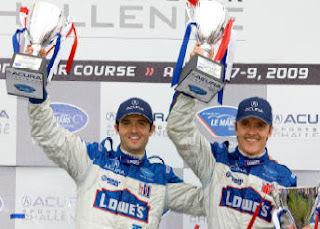 The Lowe’s team had clinched the drivers’ championship for Fernandez and Diaz at Mosport. But the team title and the manufacturers’ crown were still on the line at Road Atlanta. The 1,000-mile Petit Le Mans would be a survival test rather than a speed run. So, the Lowe’s squad was set to be consistent to get to the finish and secure the coveted championships. In Wednesday’s testing, Simon Pagenaud was quickly out front in the No. 66 XM Satellite Radio Acura, with a lap of one minute, 9.137 seconds. Dixon, coming from his win in the IndyCar Series race at Motegi, Japan, was able to jump in the de Ferran Acura to get his first laps in the car since the 12 Hours of Sebring in March. Franchitti was also able to jump into the Patrón Highcroft Acura ARX-02a on Wednesday. At last year’s Petit Le Mans, Franchitti never got the chance to race. He was planning to compete against his younger brother and Mazda driver, Marino, for the first time in their careers. However, an early-race crash by Scott Sharp eliminated the Patrón Highcroft team from Petit competition that day. So, Dario was anxious to get back in the new Acura. He, too, flew straight from Japan to Atlanta after placing second to Dixon at Twin Ring Motegi. At the end of testing on Wednesday, it was Allan McNish, in one of the Audis, quickest at 1:08.308; followed by Stephane Sarrasin in a Peugeot at 1:08.477, Pagenaud in the No. 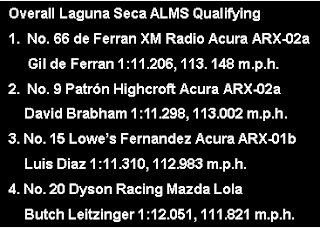 66 Acura at 1:09.137, Pedro Lamy in the other Peugeot at 1:09.234, Lucas Luhr in an Audi at 1:09.821 and Brabham at 1:10.127. Official practice opened Thursday morning and things were shortly tipped upside-down for the Patrón Highcroft team. In the practice session, Scott Sharp was driving the No. 9 Patrón Highcroft Acura ARX-02a prototype through Turn One in fifth gear when he made contact with a GT2 Porsche coming out of the pit lane. The collision was massive when the Acura’s right rear clipped the front of the Porsche. Sharp’s car vaulted into the Turn Two catch fence and flipped several times. The crash had a similar look to Kenny Brack’s in the 2003 IndyCar Series race at Texas. Almost unbelievably, Sharp was able to jump out and walk away from the incident. The car, however, was a different story. Parts and pieces were strewn hundreds of feet around the track and some 500 feet of catch fence needed to be replaced. It’s a tribute to the incredible design of the new Acura ARX-02a by Wirth Research in England and the HPD engineers that Sharp was uninjured in the spectacular wreck. The integrity of the driver’s cockpit remained intact when safety workers reached Sharp at the accident scene. Needless to say, the Acura was a complete mess. In fact, the car’s tub section was destroyed so badly that it would not be reparable for the Petit weekend. The Patrón Highcroft team’s LMP1 points lead looked to be jeopardy, with the 10-hour event just 48 hours away. So, Duncan Dayton, Patrón Highcroft Racing owner, and HPD officials determined that a spare tub sitting at HPD headquarters in Santa Clarita, Calif., could be shipped overnight by private air carrier for Friday-morning delivery at the race track. The Patrón Highcroft crew then developed a game plan to build the car from the ground up. The team, with HPD engineers assisting, assembled spare parts on Thursday in preparation for the tub’s arrival on Friday morning. The tub arrived at Atlanta’s Hartsfield-Jackson Airport at 7 a.m. and was on-site at Road Atlanta by 9:30. With a game plan in order, the 20-plus person Patrón Highcroft crew went to work building a million-dollar racing machine from scratch. Hundreds of parts needed to be added to the car’s frame and suspension, and the man-hours required were extensive. By 1 a.m. Saturday, the engine had been started and, by 5:30 a.m., the car was ready to take to the track for the race warm-up at 8:15 a.m. It was, truly, an amazing job. While the Patrón Highcroft team was building a race car, action continued on the racing surface with three practice sessions. The de Ferran squad missed the second practice round on Thursday to change an engine, while the Lowe’s Fernandez team worked on race setups in response to changing conditions. Heat and humidity became a problem for the teams. ‘Sticky’ and ‘miserable’ were the appropriate words to describe the weather conditions. Due to Sharp’s incident, most of the day’s track activities were delayed, but the night-practice runs proved fast and competitive. The two Peugeots led the nighttime session, with the Audis third and fourth. Pagenaud was the quickest of the Acura drivers, fifth overall in the session. Diaz was ninth overall and second-quickest in the LMP2 class in the dark. The steamy weather seemed to get worse on Friday. It was tough just to stand in the pit lane. I couldn’t imagine driving the race car, encumbered by all of the safety equipment. But, we also knew that the weather was going to change again on Saturday. More rain was predicted. In qualifying, Nic Minassian [you may remember him as a Ganassi CART driver in 2001 before being let go in mid-season] won the pole with a remarkable 1:06.937 lap for an average speed of 136.606 miles per hour in the No. 07 Peugeot. That is blistering fast at Road Atlanta. Franck Montagny, a two-time Acura winner last year for Andretti Green Racing, was second-fastest in the other Peugeot, followed by McNish, Luhr and Pagenaud. Fernandez took the No. 15 Acura to 11th overall and third on the LMP2 grid. On Friday morning, the American Le Mans Series held its annual ‘State of the Series’ program at which the 2010 schedule was announced, as well as some competition changes. The LMP1 and LMP2 classes will compete as one next year, with a new LMP Challenge class added. The Challenge car will be constructed by Panoz Motorsports at its Road Atlanta facility. In addition, the GT divisions will be consolidated into one category, and the GT Challenge class will also return in 2010. ALMS President Scott Atherton also talked about a continued emphasis on ‘green’ racing, and expanding the series’ role as a global leader in the use of alternative fuels. The 2010 schedule will not include the St. Petersburg race, and the Series will contest a total of nine events, with Petit Le Mans at Road Atlanta being the finale. It was amazing to see the tired-but-proud Patrón Highcroft team wheel the No. 9 Acura, completely built in some 20 hours, to the pit lane for the Saturday morning warm-up. However, the skies weren’t as bright as the Patrón Highcroft team’s spirits, as rain fell at a steady pace. Weather forecasts called for some hard rains to hit Road Atlanta throughout the day. That was a far cry from the hot and humid conditions of a day earlier. In the race, the de Ferran team had hopes of closing in on the Patrón Highcroft contingent in the LMP1 point chase with the driver lineup of Pagenaud, de Ferran and Dixon. Trailing the Patrón Highcroft bunch by 17 points and expecting the Connecticut-based team to experience some difficultly throughout the day with the new car, the de Ferran team was anxious for the race to begin. The Lowe’s squad was set for a long day of consistent runs to collect enough points to clinch the LMP2 team and manufacturers’ championships. Brabham had to start the race from the pit lane, since the team had posted no qualifying or night-practice times. But the Patrón Highcroft team did not seem to mind. Heck, they’d just spent 24 hours constructing an entire new Acura. Half of their race was actually done. The team had recorded the entire construction in time-lapse photography, which can be seen on its website and many others. It was just a remarkable feat, to say the least. Now, could the team race to the end of 1,000 miles, against the fast Peugeots and Audis, the Oreca and the de Ferran Acura? In the rain, Allan McNish, the defending Petit Le Mans champion, took the lead from the Peugeots. His mastery in wet conditions has always been impressive. De Ferran started for the No. 66 team and looked strong early in the rain. Gil locked into fifth position, and his machine seemed to handle in the wet. On Lap 17, de Ferran moved to fourth past one of the Peugeots. By Lap 28, he was third, some 50 seconds behind leader McNish. Brabham drove his way through the GT ranks and was eighth by Lap 28. The track was now drying, and teams were calling their drivers to pit for slick Michelins. By Lap 42, de Ferran moved to second overall, and he was putting in a fine effort in his opening stint on slick tires. But the race would turn sour for the de Ferran team on Lap 50. In Turn 10, de Ferran’s Acura was struck from behind by the lapped prototype of Clint Field. De Ferran spun and his car suffered left-rear damage. A quick repair job (13 minutes for a toe-link change) in the garage area got Gil back into the race. But the team’s chances to gain points on the Patrón Highcroft team were dashed. In fact, there was more damage to the No. 66 than was initially thought. The team had to replace more parts later, after Dixon slid off the track in Turn Five in wet conditions. The Lowe’s team looked to be in good shape with a three-lap lead over the Dyson Mazdas, as a result of early trouble for the No. 20 Dyson entry. A yellow flag came out on Lap 67 and Brabham pitted to turn over driving chores to Sharp. At the green flag, McNish took the lead again, with Sharp in fifth and Diaz in ninth. There was another visit to the garage to repair the right-front side of the No. 66 after Dixon’s off-course excursion at Turn Five. Dixon re-entered the race some 25 laps down to the leaders. But there was a long way to go, or so we thought. Meanwhile, on Lap 98, the Lowe’s Acura hit the pits with a steering problem. Diaz was complaining of the steering pulling to one side. The team worked to resolve the problem. At Lap 100 (2 hours, 23 minutes), the Audis and Peugeots held the top four places with the Oreca car fifth and the Patrón Highcroft machine running sixth with Sharp. On Lap 117, the No. 88 Lola caused another full-course yellow, and all three Acuras pitted. Fernandez jumped in the No. 15, while Pagenaud replaced de Ferran in the No. 66. But, during the caution laps, Adrian decided to pit again, as the steering was too bad for him to continue. The Lowe’s crew took the car to the garage, where a complete replacement of the steering rack was required. Surprisingly, the No. 9 Patrón Highcroft Acura was the only competitive Acura by Lap 140, with Sharp running sixth overall. The team’s strategy to run consistent laps and get to the end of the race was right on pace. On Lap 149, Fernandez returned to the race, third in LMP2. Sharp pitted two laps later for Dario to take over. At long last, the popular Scotsman got his chance to race at Petit Le Mans. Two years ago, he was scheduled to drive the Andretti Green Acura. But after announcing a jump to the Ganassi stock-car team, Dario was absolved of any driving responsibilities for AGR. Last year, he never got his chance after Sharp’s crash parked the Patrón Highcroft Acura early in the race. Pagenaud had a problem with a broken exhaust in the No. 66 and the car returned to the garage. Shortly afterward, a wiring harness needed to be replaced on the No. 15 Acura, as a myriad of problems continued to plague the de Ferran and Fernandez teams. By Lap 176, all three Acuras were back on track. At that point, the predicted heavy rains finally arrived. Several cars began sliding off track, including the leader, McNish in the No. 2 Audi. On Lap 184, ALMS officials decided to wave the red flag to halt the race due to the incredible downpour. In fact, “mini-streams” were forming on three separate sections of the circuit. The Peugeots, due to McNish’s spin, were listed 1-2 overall, followed by the two Audis, the Oreca car and the Patrón Highcroft Acura, which had run 180 laps. The Lowe’s Acura was 15th overall and second in LMP2. The No. 66 de Ferran mount was 24th overall and ninth in LMP1. An outstanding crowd actually showed for the Petit Le Mans event and waited out the rain, as track officials attempted to diffuse the rivers of water running throughout the facility. Ultimately, however, a five-hour delay in hopes of a restart finally ended with a checkered flag. The long, hard effort to build a car paid off for the Patrón Highcroft team with a sixth-place finish and added to the team’s point lead over the de Ferran team. Going into the series finale at Laguna Seca, the Patrón Highcroft operation held a 21-point lead. 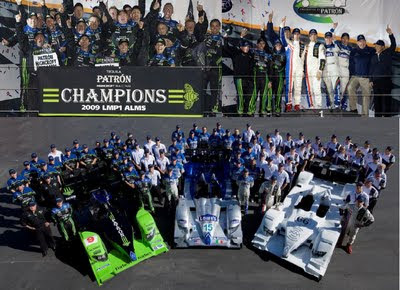 The second-place finish for Fernandez and Diaz in LMP2 gave the Lowe’s Fernandez organization the LMP2 team championship and Acura the LMP2 manufacturers’ title, representing the first time in ALMS history that a car maker has captured both prototype titles in the same season.